The 2017 edition of the Geneva Motor Show sees the presence of Magneti Marelli technology on much-anticipated new premières and launches. A European launch for Alfa Romeo, presenting the Stelvio, a sport SUV with a strong personality, at Geneva. For the Stelvio, Magneti Marelli supplies technology in the fields of lighting, electronic systems, powertrain, suspension and exhaust systems. For lighting, particular focus is on the 35W Xenon headlights, with a control unit for the adaptive system, and on the LED rear lights with the distinctive design seen on the latest models from Alfa Romeo. As well as the body computer, the electronic systems area also sees the presence of an infotainment system with a “black panel” effect display and “optical bonding” technology to improve the readability of the screen. With regards to the petrol and diesel engines, Magneti Marelli has supplied engine control units (2.0 and 3.0 petrol engines), intake manifolds (2.0 petrol and 2.2 diesel engines) and motorised throttles (2.2 diesel engines). Completing Magneti Marelli’s presence for the Alfa Romeo Stelvio, components for the exhaust system, suspension, plastic components, as well as the CDC - Chassis Domain Control module, available on the Quadrifoglio version: it is the electronic control unit developed by Alfa Romeo and Magneti Marelli that represents the "brain" of the on-board electronics and optimises handling and performance by predictively adopting control and management protocols that coordinate the action of the key systems of the car. The system anticipates and manages critical situations, informing in advance the specific control units involved in the electronic system through the vehicle networks. On the Jeep stand, the updated Compass is in the spotlight. A wide range of Magneti Marelli technology has been created to fit out this flagship model from the American manufacturer, beginning with the lighting system, from halogen or Xenon headlights to LED rear lights. With regards to powertrain, intake manifolds and motorised throttle for the 2.0 diesel version. The instrument cluster echoes the Jeep family style and offers a 7” display combined with analogue elements. The presence of Magneti Marelli technology continues in the plastics, exhaust and suspension areas with solutions created especially for the Jeep Compass. Magneti Marelli is also present on the Jeep stand on all of the Renegade and Compass models with a specially-made demonstration display panel, showing a series of screens reproducing the main functions of the on-board systems. 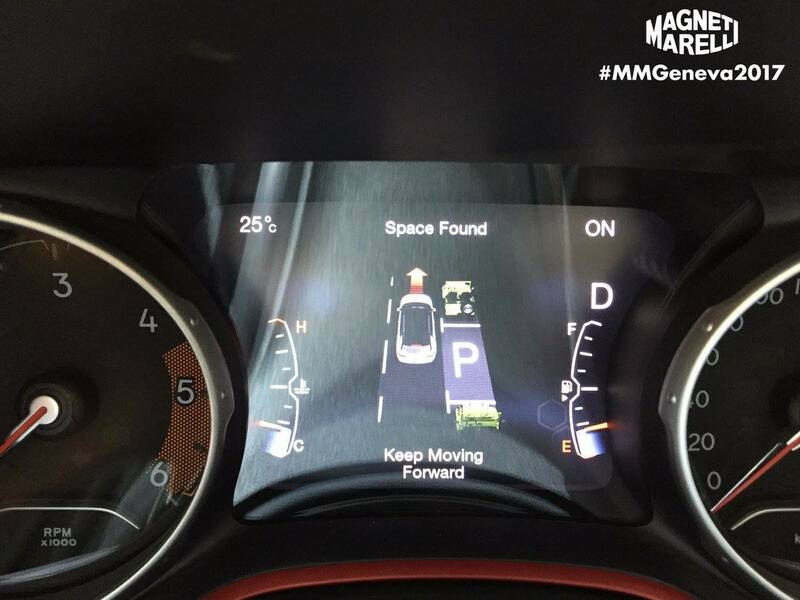 The stand has a virtual reality point which, through special visors, allows visitors to find out more about the characteristics of the Jeep and Magneti Marelli technology adopted by the Compass, including the new Xenon headlights and the instrument cluster. A range of particularly innovative technology has been supplied to DS to fit out the new DS7 Crossback, beginning with the lighting system. The headlights are full-LED and adaptive, and have a particular independent characteristic. Three LED modules are fitted with autonomous regulation to adapt the light beam to five different types of road (city, rural, motorway, difficult weather conditions and full-beam), varying the intensity and inclination of each single module. The fourth element is a LED Bi-Elight dedicated to the full-beams. The rear lights are LED with 3D plastic designs to provide depth and improve visibility and safety while driving. Dynamic indicators complete the design of the front and rear lighting systems. The stand also presents a demo station made in collaboration with Magneti Marelli Automotive Lighting which simulates the dynamic function of the full-LED headlights. Magneti Marelli technology has also been chosen for the 12.3” digital TFT (Thin Film Transistor) display panel and for the 8” central display with touchscreen technology. The DS7 also uses the Magneti Marelli Telematic Box. There are also many super-cars presented at Geneva which have chosen lighting systems by Magneti Marelli Automotive Lighting. Beginning with the Porsche Panamera Sport Turismo (three-dimensional LED rear lights linked together with a fine line of LED lights), and including the Audi RS5 (25W Xenon and LED headlights and, in the powertrain area, the motorised throttle). Magneti Marelli lighting systems have also been chosen by Opel for their new Insignia Grand Sport (LED rear lights), Sports Tourer (LED rear lights) and Suzuki Swift (bulb rear lights). The Porsche Panamera Sport Turismo has also adopted Magneti Marelli technology in the powertrain area (motorised throttle for the V8 4.0 and V6 3.0 petrol engines). There are also many models which have adopted Magneti Marelli powertrain components, including the Citroën Aircross (motorised throttle for the 1.2 petrol engine, ECU Stepper Motor) Seat Ibiza (motorised throttle, ECU for the 1.0 petrol engine and exhaust systems), Skoda Kodiak (motorised throttle for the 1.4 150 HP turbo petrol engine) and the Suzuki Swift which, as well as adopting the intake manifold for the 1.0 petrol engine and the electronic control unit for the 1.3 diesel engine, fits this version with the motorised throttle and the AMT (Automated Manual Transmission) gearbox. Again, in Geneva, on the occasion of the opening of the Motor Show on 6th March, the jury of the Car of the Year European award chose the winner for 2017. The most voted car from the seven finalists was the Peugeot 3008. The award is assigned by an international jury for the best combination of design, content and price. For the Peugeot 3008, Magneti Marelli has created highly-technological solutions such as the instrument cluster and the 12” display panel for the i-Cockpit and the 8” display for the infotainment system. These are TFT (Thin Film Transistor) displays which show information provided by the vehicle and the infotainment system. The instrument cluster can be reconfigured and comes with 3D technology. The technology supplied also includes LED rear lights and, in the powertrain field, the motorised throttle. Another three finalists for the award also carry Magneti Marelli technology: The Alfa Romeo Giulia (infotainment system with TFT displays up to 8.8” with “black panel” effect and “optical bonding” technology, the CDC - Chassis Domain Control module available on the Quadrifoglio version, halogen and adaptive Xenon headlights, LED rear lights and components for suspension, exhaust systems and powertrain components), the Citroën C3 (motorised throttle for the 1.0 and 1.2 petrol engines), and the Mercedes Benz E class (LED rear lights).